CHICAGO--(BUSINESS WIRE)-- Hyatt Hotels Corporation (NYSE: H) today announced the brand transition of The Concourse Hotel at Los Angeles Airport from a Hyatt affiliated hotel to Hyatt Regency Los Angeles International Airport. The 580-room hotel is undergoing an extensive $75 million renovation, which is scheduled to conclude January 1, 2017. Currently open and accepting guests, Hyatt Regency Los Angeles International Airport is under the expert direction of Managing Director Jeff Rostek with the support of Prism Hotels & Resorts. Located less than one block from the Los Angeles International Airport, the closest hotel to the airport, Hyatt Regency Los Angeles International Airport pushes boundaries of innovation and design with vibrant mid-century modern furnishings in each guestroom, including the Hyatt Grand Bed, the market-leading wall-mounted 55-inch television with HDMI streaming capabilities, free high-speed Wi-Fi internet, and tranquility sliding door on a well-lit modern bathroom with rain shower head. All spaces in the guestroom have been thoughtfully designed for ease of working, relaxing and staying connected to who, and what, is most important to guests at any time. Upon arrival, guests are greeted by the hotel’s Guest Experience Agents, offering an energizing welcome beverage and a sweet treat. Guests will marvel at the amazing views of busy LAX runways, the airport’s iconic Light Towers, and the sparkling City of Angels, from the comfort of their guestrooms, which features quadruple-pane windows to eliminate air traffic and airport noise. The hotel offers more than 50,000 square feet of meeting space, including one of the largest ballrooms in the LAX market at 14,000 square feet, as well as the only outdoor event lawns in the area, accommodating up to 750 guests. Additionally, a newly built state-of-the-art conference center features more than 10,000 square feet of meeting space, where people can meet, connect and get inspired. Hyatt Regency Los Angeles International Airport will launch two new exciting culinary experiences, led by seasoned Executive Chef Charles Fusco, in the hotel’s redesigned lobby on January 1, 2017. Open Market will feature stations designed around convenience and community, with grab-and-go salads and sandwiches, an Illy Café for coffee and pastries, soup and noodles, and made-to-order crafted items. Unity LA, will be available for all-day dining. Menus for Open Market and Unity LA focus on Asian and Latin American cuisines that bring the best of L.A.’s ethnic neighborhoods to hotel guests, including Boyle Heights, Monterey Park, Koreatown, Thai Town, Chinatown, Little Tokyo/Arts District, Echo Park, and Downtown L.A.
Hyatt Regency Los Angeles International Airport is the only airport hotel with direct shuttle service, which is provided complimentary to registered hotel guests and runs every 10 minutes between the hotel and airport. For more information about Hyatt Regency Los Angeles International Airport, please call (424) 702-1234 or visit www.losangelesairport.regency.hyatt.com. Follow the hotel on Facebook, Twitter, Instagram, and YouTube. 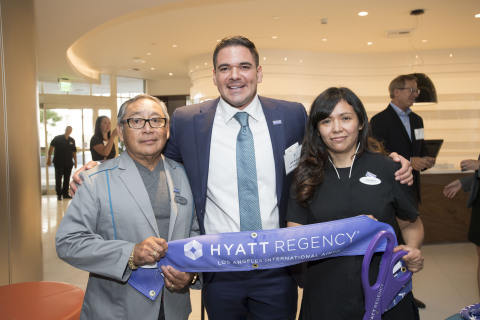 The Hyatt Regency brand prides itself on connecting travelers to who and what matters most to them. More than 168 conveniently located Hyatt Regency urban and resort locations in over 30 countries around the world serve as the go-to gathering space for every occasion – from efficient business meetings to memorable family vacations. The brand offers a one-stop experience that puts everything guests need right at their fingertips. Hyatt Regency hotels and resorts offer a full range of services and amenities, including notable culinary experiences; technology-enabled ways to collaborate; the space to work, engage or relax; and expert planners who can take care of every detail. As an award winning full service hotel management, investment, and advisory services company, Dallas-based Prism Hotels & Resorts has developed a reputation for operational excellence by increasing hotel performance and delivering measurable results. With 30 years of experience, Prism leverages top industry talent to produce a best-in-class experience that extends from the front desk to the bottom line. Prism currently manages more than 25 hotels for multiple institutional and private owners including urban, suburban and resort destinations. The company has expertise managing all major brands as well as independent destination hotels. For more information, please visit www.prismhotels.com.